Accordion FAQ For Magento 2 : Accordion FAQ For Magento 2 is an awesome module. This module adds an easy way to use FAQ Section to your Magento store with jQuery powered animation. In this module, admin can add and update FAQ. Admin Can also create FAQ group and show the group on the specific pages. On the frontend, you have an animated FAQ section for your store. Accordion FAQ For Magento 2: Accordion FAQ For Magento 2 is an awesome module. This module adds an easy way to use FAQ Section to your Magento store with jQuery powered animation. In this module, admin can add and update FAQ. Admin Can also create FAQ group and show the group on the specific pages. On the frontend, you have an animated FAQ section for your store. You can create FAQ group. Different Group can be published on different pages. Multiple groups can be published on one page. Magento2 Accordion FAQ module is very important module which enables the store admin to include FAQ feature in the website by which customer can get the answer of most common and frequent questions. After installing this module, admin can see “Webkul FAQ” in the admin-panel. First option is “Add FAQ”. Here admin can view list of total FAQs, status (enable or disable) and content for each FAQ. Admin can add new FAQ by going to “Add FAQ”. In “Add FAQ”, admin can enter the “FAQ” title, sort order, content for the particular FAQ and then can set the status for that FAQ. Admin can add new FAQ. Admin can set the status for any FAQ (enable or disable). Admin can delete any existing FAQ from the list. The second option in “WebKul FAQ” is of FAQ group. Here admin can see FAQ groups, status, banners, width. 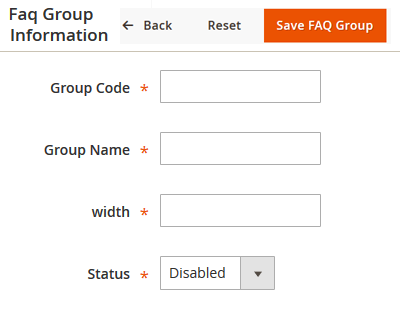 Admin can select any FAQ group and delete it or can change its status (enable or disable). Admin can add a new FAQ group by going to “Add FAQ”. Admin will enter group code, group name and set the status. Admin can delete or change status of any FAQ group. Admin can add new FAQ group. Did you buy Accordion FAQ For Magento 2? + Compatible with version 2.2.*. + Fully Admin management, admin can create multiple FAQ's as per admin needs. 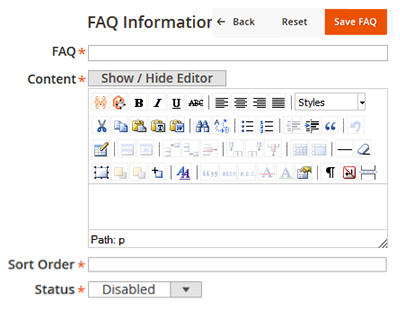 + Content area for FAQ is rich with WYSIWYG editor that means admin can use interactive font style and font size. + Module is based on java script that means will work on all devices and screens including responsive templates. + Adjust Width as per your ease.